Kids can build a whole city in an afternoon with Papierowe Miasto's Paper Town. Designed by Robert Czajka,these amazing little play scene villages are made from recycled cardboard. They come in flat pack envelopes and each piece is ready to be folded along perforated lines. No glue or other tools are needed to complete the project. Keep reading to learn more about each of the three cardboard towns. Available in three versions of different colors Papierowe Miasto’s Paper Towns are inspired by Polish suburban life. Each set includes a variety of buildings and vehicles printed with colors, patterns and details as small as placing a driver behind the wheel fo the bus. Paper Town #1 is red and blue and comes with two buildings, tree, fountain, fence, store, bus, garage and cars. It’s more of a residential scene complete with house. Paper Town #2 features green and yellow elements and comes with a bus station, bus, restaurant, playground, terrace, department store, monument and market place. It’s more of the city center. Paper Town #3, which is admittedly girly in its coloring of pink and purple, pushes gender stereotypes because its all about the vehicles. In this set you’ll find a car workshop, cars, four trucks, gas station, motel, car and neon sign. Collect all three sets and your kids will have a really amazing recycled cardboard town to play with! Even though Paper Town is not yet available in the US and this must ship from Europe, they are lightweight flat pack items. Available in three versions of different colors Papierowe Miasto's Paper Towns are inspired by Polish suburban life. 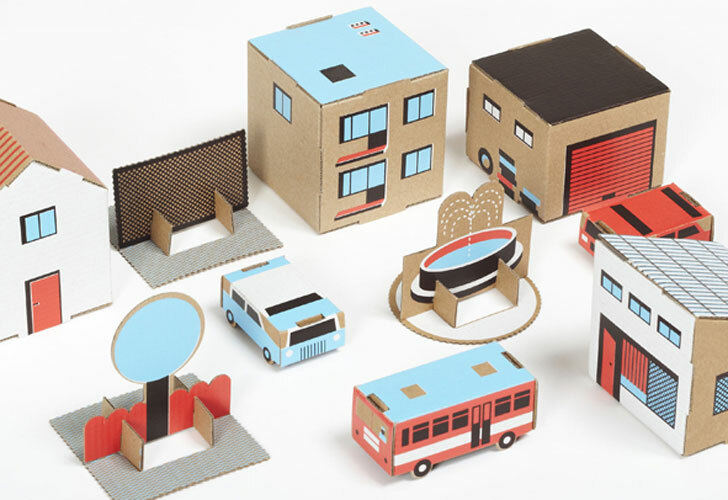 Each set includes a variety of buildings and vehicles printed with colors, patterns and details as small as placing a driver behind the wheel fo the bus. Paper Town #1 is red and blue and comes with two buildings, tree, fountain, fence, store, bus, garage and cars. It's more of a residential scene complete with house. 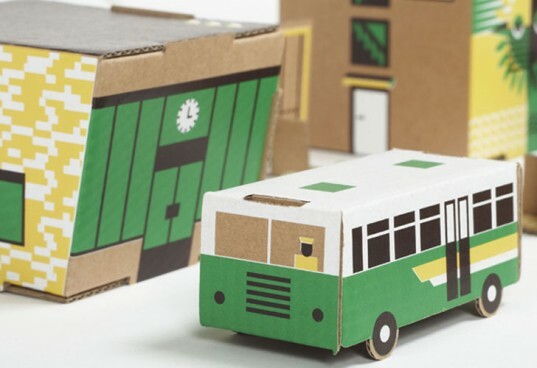 Paper Town #2 features green and yellow elements and comes with a bus station, bus, restaurant, playground, terrace, department store, monument and market place. It's more of the city center. Paper Town #3, which is admittedly girly in its coloring of pink and purple, pushes gender stereotypes because its all about the vehicles. In this set you'll find a car workshop, cars, four trucks, gas station, motel, car and neon sign. Collect all three sets and your kids will have a really amazing recycled cardboard town to play with!